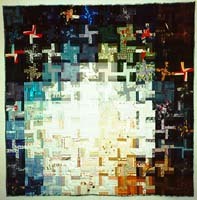 At right: "Blue Moon #1: a GREEN QUILT" © 1996 Patricia Ciricillo, Ellicott City, MD. 59" x 59". Call for Entries: The New England Quilt Museum is preparing an exhibition in the Summer of 1999 on Endangered Species. We are seeking all types of quilts which focus on endangered animals. Please send an SASE by August 1 to Jennifer Gilbert, Curator, New England Quilt Museum, 18 Shattuck Street, Lowell, MA 01852 for rules and regulations. Entry fee will probably be $15, slides will probably be due in February or March of '99. The exhibit will hang during the summer - probably during the Lowell Folk Festival in July just after the Vermont Quilt Festival. Entries can be pictorial, abstract, traditional, contemporary, art, whatever.......as long as the show theme is represented.